This is one thing that I was going to wait awhile before we talked about, but maybe we’ll talk about it now so you can think about it, because you all, we all, have to make some kind of plans for ourselves. It’s a free concert from now on. The Woodstock Music and Art Fair has thousands of pieces. Most people’s first thought is of the festival’s famed performers and their music. Drugs, mud and the kindness of strangers often follow. On docent tours at Bethel Woods Center for the Arts Museum, we try to give a complete and accurate portrayal of that weekend. The Museum’s designers knew that they had to put the event in perspective and thus the whole 60s theme that guests encounter before actually getting to Woodstock. The organizers knew that other festivals that summer had had confrontational issues between the young people attending the festival and local law enforcement’s responsibility to maintain order. 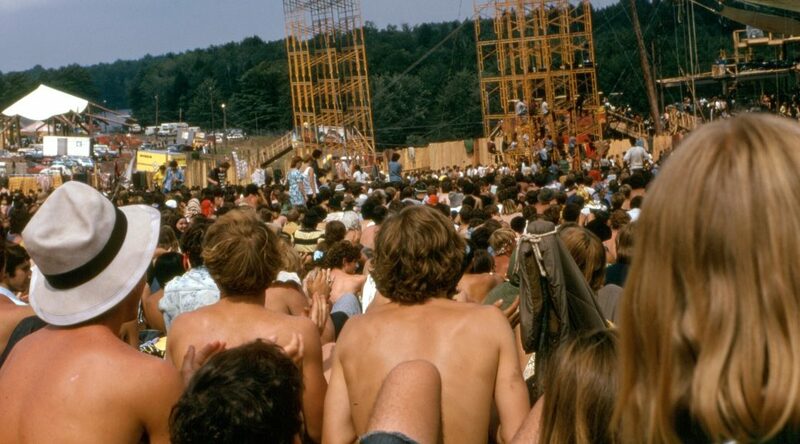 Woodstock Ventures successfully kept the peace by distancing uniformed officers from the Field itself and keeping the throng of attendees well-informed in a calming manner. John Morris was the Production Coordinator at Woodstock, but his voice (as well as that of Chip Monck) became as important a part of the event and Jimi Hendrix’s Star Spangled Banner. As disorganized as the Woodstock Ventures may have appeared, the four organizers brought on talented people to carry out their vision. John Morris had already helped set up the short-lived but successful Anderson Theater in New York City before helping to set up the more famous Fillmore East. He would go on to create and own London’s first major rock concert venue, The Rainbow and produced live concerts for bands including Paul McCartney’s Wings, The Grateful Dead, The Moody Blues, The Jefferson Airplane, Jimi Hendrix, The Doors, and Santana. Stage announcements became absolutely necessary for communication and those who made them had to be clear, truthful, and reassuring. John Morris was that and his voice remains one of the strongest of my memories of my time at Woodstock. Thank you John. John and his Woodstock memories (poor audio quality). John continues his lifetime association with the arts with Objects of Art. He and Kim Martindale have created a unique collection of art shows curated to create a unique art experience.